Alpiq Hydro Aare AG manages the Flumenthal, Ruppoldingen and Gösgen which use the power of the River Aare to generate 90 MW of electricity, without using significant reservoirs or altering flow. Kraftwerke Oberhasli (KWO) from the 1930’s through 1979 built a constellation of power plants, seven hydro dams, a natural lake and around 130 km of water carrying pipes. The total output of the KWO system is 1100 MW, equivalent of a large nuclear plant. This network supplies 7% of the hydropower for Switzerland. 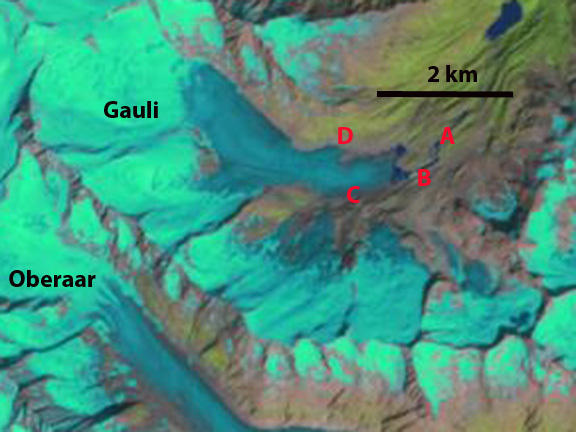 The glacier has been in rapid retreat since 2000, with the Swiss Glacier Monitoring Network identifying a retreat of 246 m from 1958-1990, 132 m from 1990-2000 and 864 m from 2000-2013. KWO hydropower scheme for Aare River. 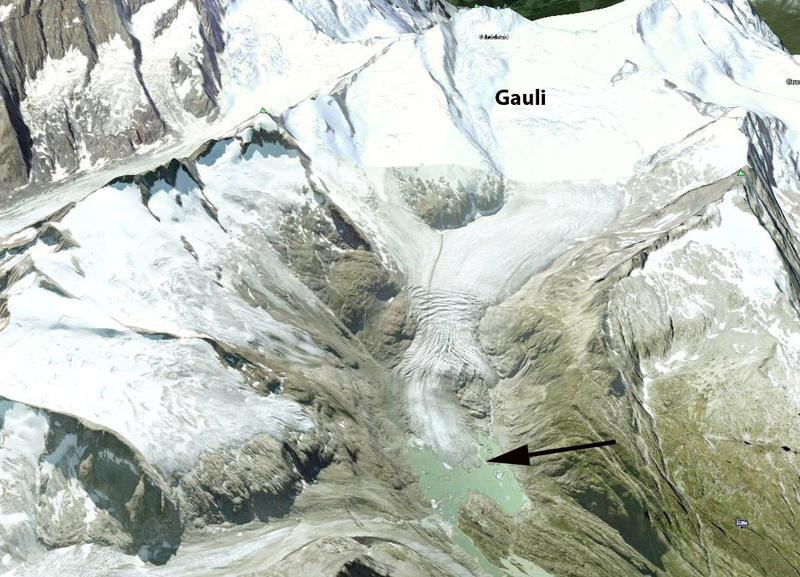 Google Earth 2007 image showing new lake that the glacier is calving icebergs in. Here we use Landsat satellite imagery to examine the retreat, the formation of a new lake and the retreat from that lake during the 1990-2013 period. 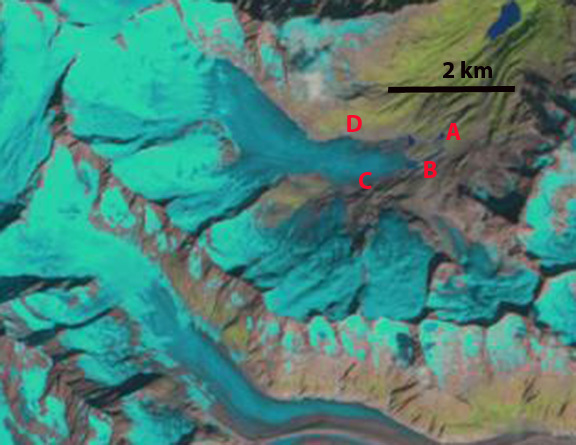 The Glaciers Online site has excellent images of the retreat of this glacier during the lake formation phase from Jürg Alean and Michael Hambrey. 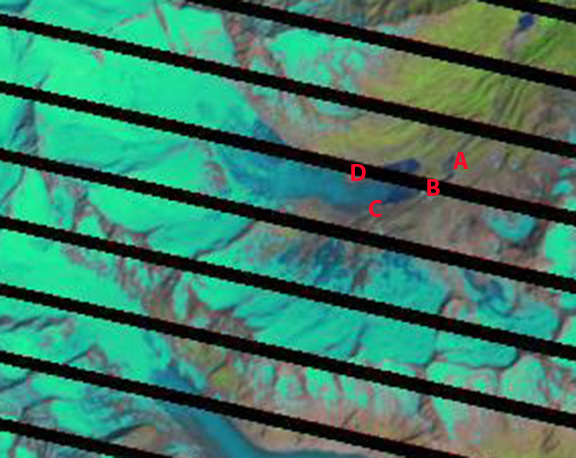 In each Landsat image Point A-D are fixed to provide a comparison of terminus change. 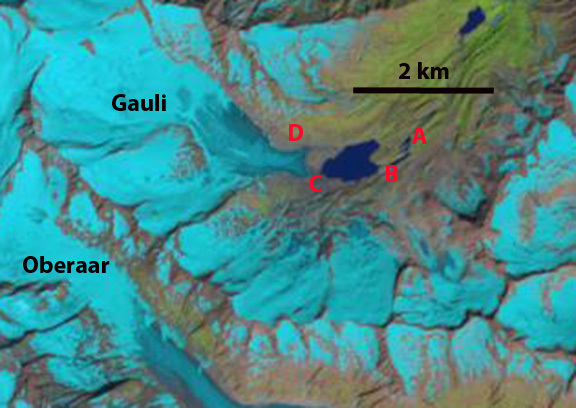 In 1990 there is no lake at the terminus of the glacier, the terminus has a low slope ending at 2170 m. By 1999 a tiny lake can be seen forming at the northern side of the terminus as the glacier has retreated into a basin. By 2002 there are two small lakes at the north and south corner of the terminus. In 2007 the lake has coalesced into one lake that is 500 m wide and has a length of 600 m on the northern and southern margins and 250 m long in the middle, where ice is still calving into the lake as seen in the Google Earth image above. By 2013 the glacier has retreated out of the 800 m long lake, and terminates 100-150 m from the lake shore. The terminus in 2013 is approaching the base of a steeper slope with more crevassing. This region has thinned both in width, depth and has lost crevassing. The retreat will slow as the glacier retreats up the slope, but is not near an end. 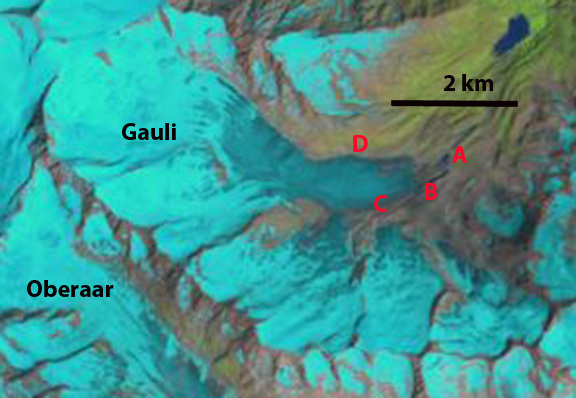 This entry was posted in Glacier Observations and tagged aare glacier retreat, Bernese oberland glacier retreat, gauli glacier retreat, gauligletscher retreat, glacier hydropower. Bookmark the permalink.